These mosaic-style pendants are hand-stamped and finished with a bright blue glaze. 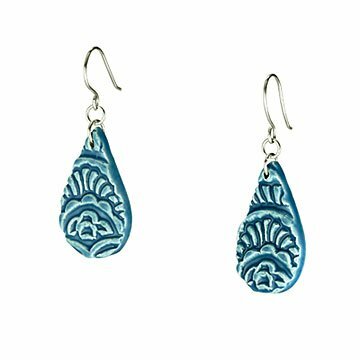 Like parcels collected from a giant clay mosaic, these hand-stamped earrings frame your face in artful detail. Beginning with a fresh slab of earthenware clay, artist Natasha Justice delicately carves each pendant in the shape of a teardrop that is then stamped with fluid strokes that elicit moving water. Fired in a kiln, finished with a bright glaze, and hung from sterling silver wire, the pieces make their way from Natasha's studio in Ohio to your unique jewelry assortment. Make it a set! Click here to see the matching Tri Color Cluster Necklace. Potter Natasha Justice brings sculpture and style together with her sculpted stoneware accessories. Her hand-crafted ceramic designs are characterized by their distinctive lines and sumptuous detail work. Each piece maintains its own individuality through the glazing and firing process, enabling every customer to receive a one-of-a-kind piece of wearable artwork. Use polishing cloth to remove tarnish from the silver. Showering and swimming while wearing earrings is not recommended. I ordered these for my mom for mother's day, and they turned out perfectly. Great length, not too heavy, and really unique. My mom was so happy with them! It was a little surprise gift for my wife. Beautiful and unique earrings that will go with virtually every outfit! They are a bit longer than expected, but not in a bad way! They aren't heavy on the ears at all!!!! I bought them for a friend's birthday, and she absolutely loves them!! !